Happy Wednesday! Thanks for coming by today to check out my newest SCRAPTURES Wild Card Wednesday project. The Journalling Card Elements in this month's kit make it quick and easy to put together some super cute birthday cards. I love how the words fade away in spots on the "It's Your Day" paper. 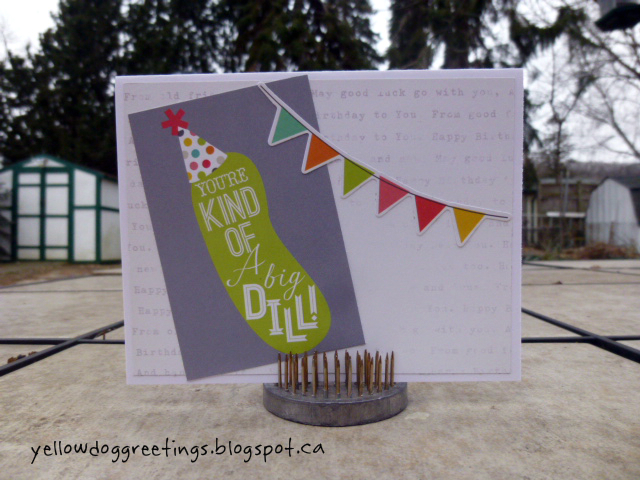 When I saw the pickle, I knew that would be for a co-worker who has his birthday in April, he's a practical joker so I know he will appreciate the "big dill"
Super cute card, I giggled when I read the sentiment, perfect background paper. Great job!! !